Megan Arkinstall discovers seven decadent ways for foodies and wine appreciators to spend a long weekend of pure indulgence. 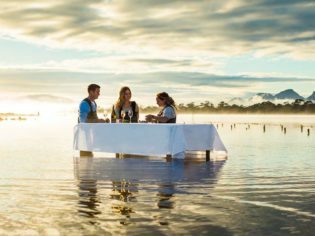 Imagine standing knee-deep in a stunning wetland sipping champagne and tasting prized Pacific Ocean oysters. 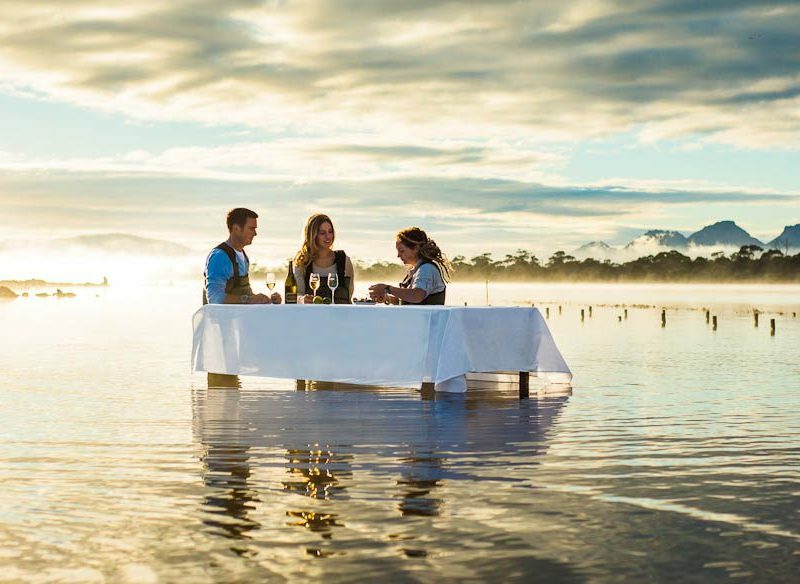 Guests at Saffire-Freycinet can opt to don a pair of waders and do just that. Have a go at shucking and gain an understanding of the local ecology. But if oysters aren’t your thing there’s a bevy of other experiences where you can wine and dine – learn the art of winemaking, watch a cooking demonstration or join a mixology cocktail class. And, with contemporary furnishings, generous views, plush bedding, locally-sourced gourmet cuisine and a delicious spa menu, if you just want to hibernate inside for the weekend, we don’t blame you. Details: From $1350 per night (oyster farm visit complimentary). Tussie Mussie is a Pinot Noir and Pinot Gris vineyard with beautiful boutique accommodation hidden up a long driveway flanked by olive trees and vines. Spend two nights in The Old Laundry wrapped in luxe sheets, or by the cosy wood burner, and enjoy the local produce. An iced bottle of French champagne will greet you on arrival, followed by a gourmet breakfast basket each morning, then indulge in a three-course dinner with matching wine at the hatted Lé Patanque French Restaurant. A double pass to the Peninsula Hot Springs will give your palate a rest… for a couple of hours anyway. Details: The Le Weekend Package from $1500 per couple. Hahndorf in all its excess. Australia’s oldest living German settlement, Hahndorf, is a quaint village located in the Adelaide Hills. The town retains its German heritage with many historic ‘Fachwerk’ buildings (with traditional German timber frames) lining the main street – one in particular is the 1839 German Arms Hotel; a great spot to feast on German fare and a stein of beer. And for a fully indulgent experience, The Manna of Hahndorf, a boutique hotel right in the heart of the town, offers a package including breakfast, a cheese platter and a ChocoVino experience at Hahndorf Hill Winery, where you match wine to chocolate. An extra hole in the belt is probably a necessity by the end of the weekend. The Royal Mail Hotel is not your average country pub – this one wears three well-deserved hats. The award-winning tasting plates should definitely have you rethinking pub food. To truly appreciate the first-class cuisine – which is created from local organic produce collected straight from the kitchen garden – the hotel offers a ‘Dine and Unwind’ package that includes a tour of the garden with accommodation, handcrafted chocolate, dinner for two with matching wine, breakfast and a late check-out. And to work it all off, you can explore the many walking trails leading to the nearby Grampians National Park. Details: Dine and Unwind Package from $945 per couple. The Grove is a winery, distillery, brewery and accommodation all in one. Located in the beautiful Margaret River region, the three simple and self-contained accommodation options come with private jacuzzis and gas log fires; a great option for a get-together with a group of friends. Why not add a private whisky tasting to your stay… set up in the Whisky Room, you will be expertly guided through the one-hour tasting of The Grove’s own whisky and a single malt selected by the The Scotch Malt Whisky Society. Finish off with a freshly roasted coffee – you may need it. Details: From $780 for three nights. Private whisky tasting is $110 per person. Autumn strikes the Strange Bird winetasting trail, Granite Belt, Queensland. For wine tasting with a difference, take the Strange Bird trail in the Granite Belt boutique wine region. The trail is dedicated to alternative grape varieties like Petit Verdot, Viognier and Barbera. To be considered ‘alternative’, a variety must not represent any more than one per cent of the total bearing vines in Australia, according to the Australian Wine and Brandy Corporation, so you know these drops are pretty unique. Located near three of the wineries on the trail (Tobin Wines, Ballandean Estate and Golden Grove) is Azjure Studio Retreat; modern, self-catered accommodation with a beautiful backdrop. Always wanted to throw a dinner party but not so sure about the actual cooking part? No worries – the Blue Bowl Brown Sugar Cooking School in Bowral offers experiences where you host a dinner party, and they teach you and your guests how to cook each course. They will help you design a menu and will bring the ingredients and equipment to your chosen venue. As for the venue, we suggest booking out the Seidler House for a weekend: this divine award-winning home overlooks the gorges of Wingecarribee River – but more importantly, boasts a large kitchen and a huge entertaining area with fireplace. Perfect for entertaining. Amazingly, or not, I’ve done them all – except #4 in Country VIC, tho I’ve been there on quick drive-through. You were right to make TAS #1, says this former food & wine tour operator on the Freycinet Coast.